Now that you have signed up for a Premium subscription, follow the step-by-step instructions below to customize your Internet using Mobicip Premium! Using any browser, login at mobicip.com. 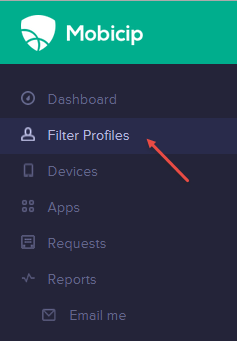 Select Filter Profiles from the menu. For the filter profile you wish to edit, click Edit Filter Settings. Click the “Categories” tab to see several drop-down categories for filtering purposes. These allow you to customize what should be allowed or blocked. Click on the specific category to block it. Any category that has red block icon will be blocked. If you wish to allow certain categories that have been automatically blocked, simple un-check the option. To block a category that are not blocked by default, simply click on the box to check it. To block a website, just enter the domain. To block a sub-domain while allowing the main domain, enter only the sub-domain. For instance, you could block 'images.google.com' while google.com is allowed. To block a sub-directory or link while allowing the main website, enter only the specific URL starting with the domain. For instance, you could block 'amazon.com/intimate-apparel' while amazon.com is allowed. Once finished, allow up to 15 minutes for the changes you made to be sync'ed with your device. The same steps apply to the 'Whitelist (Allow) Websites' tab as well, of course, with the exact opposite effect.